Today I'm sharing the final smoothie of my week-long welcome back series--A Smoothie A Day. Today's smoothie is a relatively new concoction of mine. It features a hint of sweetness with a just the right touch of earthiness. The bold flavors blend together to make one downright taste beverage. I'm typically not a fan of chocolate smoothies, but this is the exception. It has just a tiny bit of coca power, giving it a bit of sweetness without being overpowering. One of my earliest attempts included avocado. Needless to say, I was not a fan. You'll notice that the majority of my smoothies include vanilla or almond milk. Once upon a time, I was pretty big on using regular milk in my smoothies. But then I started paying attention to the amount of sugar and calories, and set out to find a healthier alternative. It wasn't long before I stumbled upon my trusty vanilla milk. On average, vanilla milk has 4 grams and 20 calories less than skim milk. When you compare it to whole milk, those calories and grams of sugar increase exponentially. As with most smoothies, this recipe is pretty no fuss. Add all of your ingredients to the blender. Blend well. Add ice as needed. Pour into glass. Add garnish or toppings if desired. Serve with a smile. I hope you all enjoyed my A Smoothie A Day series. I've got so much planned for you guys in the upcoming weeks and months, but most importantly, I'm just happy to be home. Don't forget, there's still time to win that $50 Earth Fare gift card. Use the rafflecopter widget below to enter into this giveaway. Remember, the giveaway is only open to US residents 18 years or older. Again, thanks for following along! Come back and see me soon. I've never thought to add mint to my green smoothie, but it sounds so refreshing. Perfect for cooling down after the gym! Yes, it is PERFECT for after the gym! Thanks so much for stopping by! This looks so refreshing! I make green smoothies all the time, but I never thought to add mint! Now that warmer weather is coming, it will be perfect! This was one of my first times making a smoothie with mint. Turned out great! I'm going to be adding it to more green smoothies in the future. This sounds delicious and looks gorgeous! I don't use mint much, but I bet it would be so refreshing. 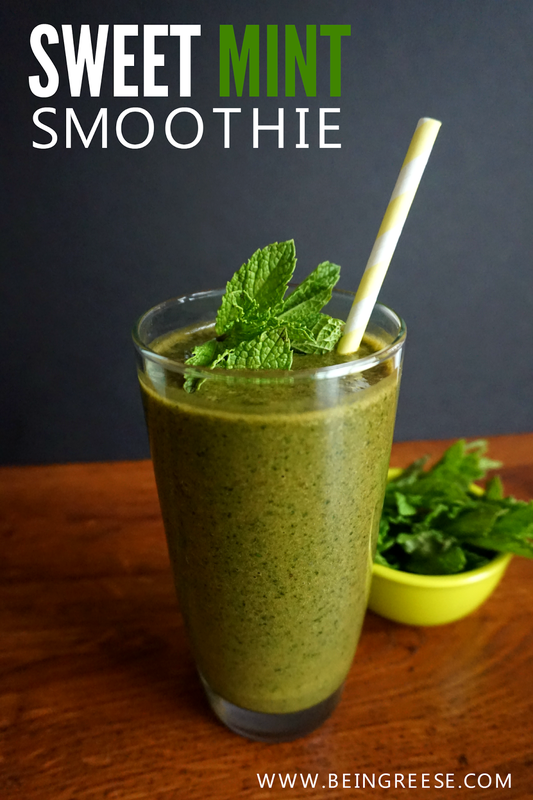 I wasn't a fan of mint until I used it in this smoothie. Now it's growing on me a bit. Another great one! Looks so refreshing and delicious. I love that you added mint. Mint is one of my favorites. Can't wait to try it out. Yum! Thanks hun! Let me know what you think when you try it out! This looks delicious! Mint is one of my favorite things! It's one of my favorites now. Thanks for stopping by! Oh my -- this sounds crazy good. A must try for soon. It is crazy good. The perfect fix for a sweet tooth without overdoing it. Sounds delicious and like something to try! yum!! that looks really refreshing! I love mint flavored things! I love that you used the fresh leaves. This smoothie looks heavenly! YUM! Oh I bet my husband would love this one. OMG, Mint! What a perfect idea! This sounds so inviting. I really need to step my smoothie game up. Let me pin this real quick ;)! I love smoothies but have never thought about adding mint to the combination. I'll have to give this a try. Thanks for sharing! I love adding mint to smoothies, such a nice fresh flavor!